Natural drops used at the time of basketing and upon returning from the race, helps limit the possibilities of development of an infection which could lead to an increased production of mucus. 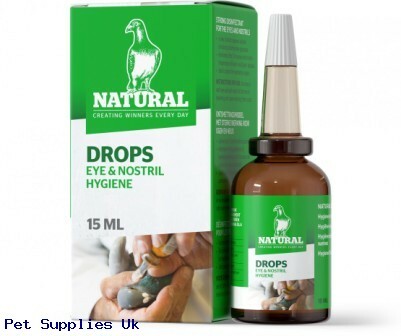 The use of this bactericidal solution is recommended for an excellent hygiene of the pigeon’s nostrils and eyes. Tear open the aluminum capsule and remove the rubber plug, fit the dropper. One drop in each eye and each nostril at the time of basketing and upon returning.